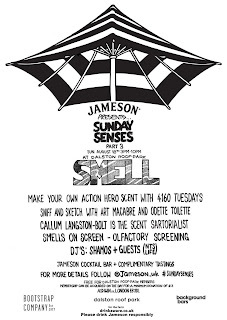 "Jameson Irish Whiskey Presents ‘Sunday Senses’ at Dalston Roof Park. 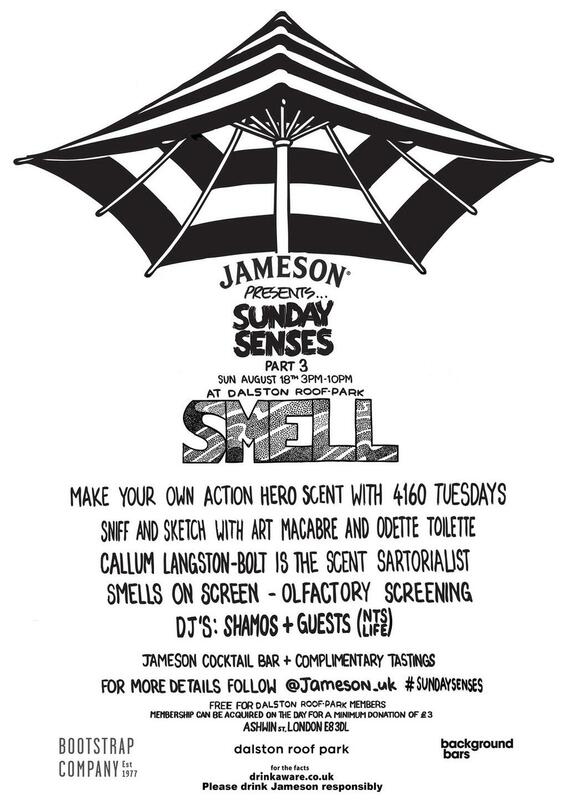 Local creatives, musicians, scientists and chefs have been invited to deliver chapters on each sense, with SMELL being celebrated on Sunday August 18th with a day and evening dedicated to all things olfactory. Whiskey and SMELL go hand in hand as the aromatic sweet distinctive notes of caramel and toffee constitute a key element of Jameson’s tasting and enjoyment. Exclusive cocktails and ‘picklebacks’ will be available from the custom made Jameson bar. Dalston Roof Park’s visitors will be able to relax, discover the secrets of whiskey at one of the complimentary whiskey tastings and drop to various workshops hosted by scent specialist Odette Toilette. Resident DJ Shamos (NTS) will invite his friends to create the day’s soundtrack. Perfume house 4160 Tuesdays will recreate scents of favourite action heroes; attendees will be invited to blend raw materials to make the sort of cologne Rocky would have doused on before a bout, or that Hans Solo might have spritzed on before flying a spaceship. For the artistic ones, Art Macabre will present a ‘Sniff and sketch’ session and translate smell into visual art. Be ready to wield a sharpie and to subject your airways to some seriously unique smells! Callum Langston-Bolt of London perfume emporium Les Senteurs will be the day’s scent sartorialist and offer group and one to one sessions on the etiquette of fragrance. The day will close with Smells on Screen, a finale tour through films, with a scent twist. Taking in westerns, sci-fi, film noir and thriller, Odette will give the audience some of the most unusual of contemporary niche fragrances to try, each one connected with one of the film shorts. Food will also be available on the roof with Hanoi Kitchen serving their tasty fragrant Banh Mi. Sunday Senses will be back in September with a Whiskey & Words dedicated to ‘SIGHT’ on the 8th and a closing event celebrating ‘TASTE’ on the 15th, with Dalston Roof Park’s in-house restaurant Merci Marie teaming up with experimental food specialists the Robin Collective. Local artist Rob Whoriskey’s art show Oyster Flesh continues downstairs at the Print Gallery until September 6th."